Unless the country embraces the ideal of cultural pluralism within one nation, crises like this one will continue to erupt. 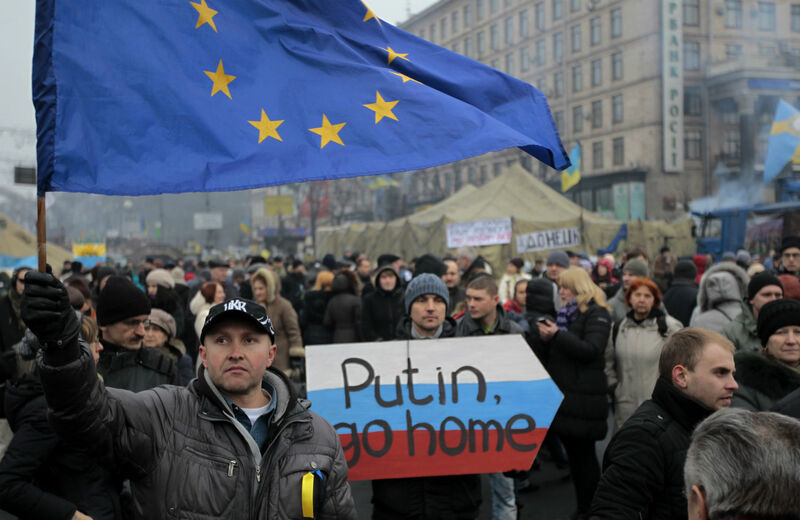 At a rally in Kiev's Independence Square on Sunday March 2, protesters urged President Putin to withdraw troops from Crimea. (AP Photo/Sergei Chuzavkov). There is now a real and growing danger of military confrontation or war in Ukraine. Political authority in Ukraine, already weakened by months of confrontation between an irreconcilable political opposition and an irresolute president, seems to be disintegrating before our eyes. The country can be compared to a patient who in the attempt to cure one ailment has unleashed a host of others. In this case, the effort to rid the country of corruption and nepotism has led to a highly questionable transition of power, economic collapse, a rash of vandalism and vigilante justice all across Ukraine, the rise of radical nationalism and even the possible loss of Crimea, accompanied by Russian military intervention on Ukrainian soil. Things seemed benign enough last November, when people gathered spontaneously on the Maidan to protest the government’s decision to delay the signing of the EU Association Agreement. Their protest was belatedly joined by leaders from the parliamentary opposition parties, who sought new elections. But it was the uncompromising stance of the radical alliance known as The Right Sector that actually led to Yanukovych's ouster. Without the latter’s willingness to use violence to overthrow the old regime, both the amnesty agreement of February 17, and the political accord witnessed by the foreign ministers of Poland, Germany and France on February 21, would be in place today. Had that accord been implemented, the country would have first established a new constitutional framework and then preceded to hold presidential and parliamentary elections under it. Instead, having staged a classic coup d’etat that “self-removed” the president, the political opposition parties now find themselves beholden to those that brought them to power—the radical nationalists. Given the hopes of so many in the West regarding this latest Ukrainian revolution, it is important to clearly understand the radical nationalist agenda. Within the parliament they are represented by the Svoboda Party, which received just over 10 percent of the vote in the last parliamentary elections. Citing Svoboda’s “racist, anti-Semitic and xenophobic views,” the European Parliament issued a resolution on December 13, 2012, that called upon on all pro-democratic parties in Ukraine “not to associate with, endorse or form coalitions with this party.” Today Svoboda holds key leadership positions in the parliament and law enforcement, four ministerial portfolios in the new government and several appointed governorships. Calls by the new speaker/acting president for the Maidan to disband have been ignored. In recognition of its own weakness, the parliament gave in to demands that the new government be ratified by the Maidan. This, in effect, creates two centers of governmental authority, a sure recipe for paralysis and demagogic populism. It is hard to imagine, for example, that austerity measures proposed by the government will be approved by the Maidan. • One of its first acts was to repeal the 2012 law allowing Russian and other minority languages to be used locally. While the speaking/acting president has promised to reverse this, its passage was one of the main irritants between the predominantly Russian and the predominantly Ukrainian speaking regions of the country. • It introduced a resolution to outlaw the Communist Party of Ukraine, which received 13 percent of the vote in 2012, and which, after the collapse of the Party of Regions, is the country’s last major political opposition party. Both the Party of Regions and the Communist Party have already been declared illegal in several Western regions by local legislatures that continue to function independently of Kiev. • It consolidated the powers of speaker of parliament and president in one man, amassing greater powers in a single individual than is allowed under any Ukrainian constitution. It recently went even further, dismissing several justices of the Constitutional Court, and asking the newly appointed prosecutor general, a member of the Svoboda party, to bring charges against them. • Finally, it created a new Lustration Committee to prevent those who supported the previous government from ever assuming political office again. Lustration, from the Latin term for purification, refers to mass disqualification of those who served under previous communist or Nazi regimes. They were highly controversial in Eastern Europe because of the propensity of political authorities to target potential political rivals. Judging from this interview with the chairman, it is likely to prove no less so in Ukraine. In effect, the parliament now rules without any constraints on its power. Many had hoped for some signs of compromise in the new interim government, now headed by Arseny Yatseniuk, and it does indeed contain several ministers without party affiliation. Alas, of nineteen ministerial appointments, only two hail from the east (both from Kharkov) and none from the south, severely limiting the government’s geographic appeal. Meanwhile, on the verge of economic collapse and with at least 140 billion dollars in external debt, Ukraine has appealed for urgent financial support. The IMF and the EU, however, are in no rush to offer it, demanding a comprehensive package of reforms first. This combination of delay and austerity is likely to further undermine the new regime’s popularity on the eve of presidential elections, set for May 25. Will those elections be fair? Considering that the government is insolvent, that vigilante militias continue to disperse public gatherings they disapprove of, and that party headquarters all across the country (both pro and anti-Maidan) have been looted and burned, many Ukrainians are deeply skeptical. Even in Crimea, the government recently put in place by local “self-defense forces” has asked only for a referendum, citing the need to guarantee its autonomy “under any changes in central authority or the Constitution of Ukraine.” The referendum question in fact stipulates that Crimea “is part of Ukraine on the basis of agreements and accords.” In this context being “pro-Russian” does not mean joining Russia. It means speaking, worshiping, and going to school in your own language, in your own country—Ukraine. There is little that any external power can do for Ukraine until it resolves this fundamental internal dilemma. And it will not be resolved by any discussion that takes place in New York, Brussels or Moscow. The partners that need to resolve their differences are all inside Ukraine, and the issue they need to address is full equality between the two major cultural components of Ukrainian identity, Ukrainian and Russian. Only this can provide the basis for a common vision for the future shared across the entire land. Ironically, in Crimea the Ukrainian parliament now faces the same choice that president Yanukovych faced before his ouster: to use force against those whom it considers criminals and separatists, or to enter into negotiations to cede some amount of political authority to the protestors. God willing, the current situation can be resolved with less bloodshed. But unless the country embraces the ideal of cultural pluralism within one nation, similar political crises will continue to erupt periodically, until the day that each side despises the other so much that they can no longer stand to be together.